Here are the girls on Easter Morning...aren't they cute in their jammie's with their bed head hair. I must say that kids totally make holidays more fun! I love the excitement and joy that comes out on their faces!! The girls each got a basket full of candy and cute little baby's in a purse (I know that sounds wired so I might have to explain it better...its a purse that turns into a bassinet with a baby in it). Well they are a hit and have been a great toy for church!! 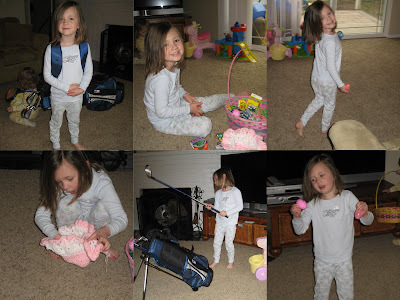 Oh yeah Dad also splurged and gave them a set of golf clubs. I think he is nervous that we are only going to have girls, so this is his way of getting them into something he loves:) Such a cute dad!! Here they are in their cute Easter Dresses... meaning two dresses each girl. I have the BEST mom and mother in law ever!!! They each sent these cute dresses for the girlies for Easter! The girls loved wearing them...we have been switching between the two on Sundays for the past few weeks. Thanks Grannie Terry and Grannie Frannie, we love you both so much!! For Easter Dinner we had some Law school friends invite us over for dinner and an egg hunt for the kids. It was so fun to visit and eat good food!! The kids again had a blast playing and hunting for eggs. 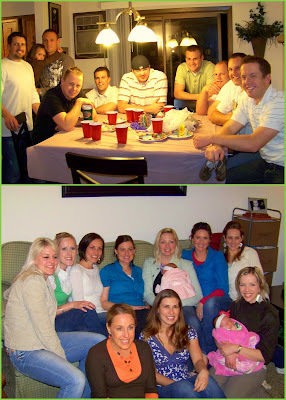 We are so lucky to have such great friends here in Spokane!! 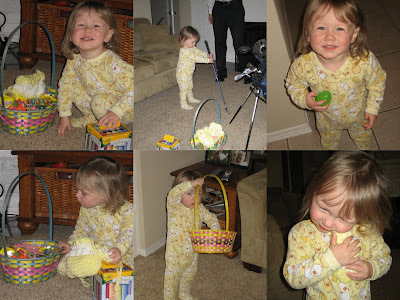 We had such a fun weekend getting ready for Easter. The girls had a ball coloring eggs and making yummy rice crispy treats. 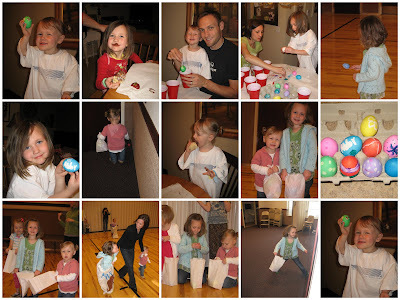 The Ward had a fun Easter lesson and egg hunt on Saturday morning. It was great and indoor so it was warm! Abby did great in the relay races and both girls made it out with a TON of eggs!! 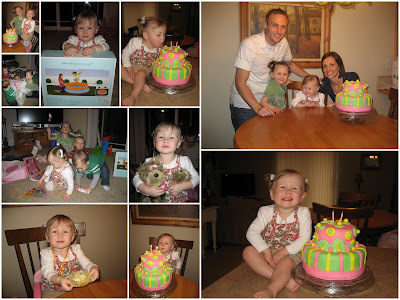 I can't believe my baby is 2...time goes by way too fast! Audrey absolutely loved her special day! She knew from the minute she woke up that it was her Birthday!! We sang to her over 20 times due to her request. She LOVED her cake...it was hard to keep her away from it until the party. She wanted to lick it so bad!! Thanks to our friends and family for making the day so special!! Happy Birthday Podgie we love you so much!!! has the cutest piggy tails ever! has the best crooked smile!! On a side note...we are vetoing the private blog. I guess you can only invite 100 readers and we want to invite more than that. So thanks to all those who left their emails and want to keep up with us...sorry about the craziness.